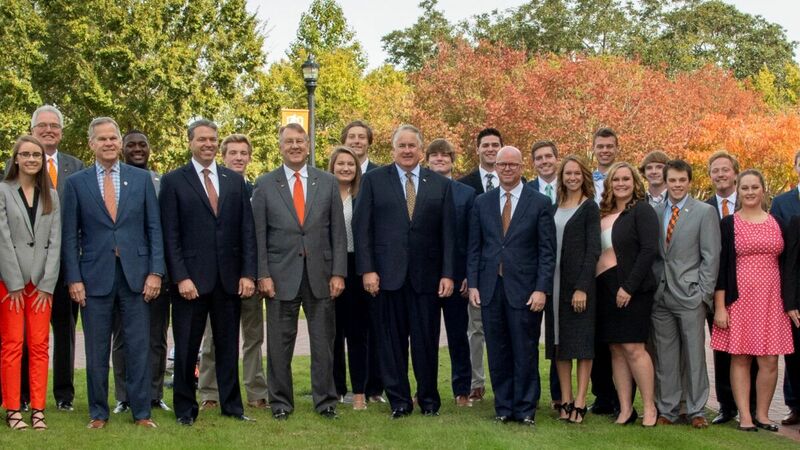 Leadership officials from Campbell University, the Lundy-Fetterman School of Business and BB&T convened recently to celebrate the dedication of the BB&T Business Fellows Program with its two inaugural cohorts of students. The group gathered for lunch and a time of meaningful reflection to highlight the impact of BB&T’s $1 million commitment to endow the transformational initiative. During the time of reflection, students had the opportunity to share the role of the BB&T Business Fellows Program in their experience thus far. “The BB&T Business Fellows Program has created a new family for me at Campbell University. We challenge one another to be leaders and innovators, both in the business school and around campus,” said Aaron Schnoor, a sophomore Trust and Wealth Management major from Apex. Matthews joins the program from nearby Godwin and expressed that he has found comfort from his community of peers in the midst of a recent family tragedy. Reed announced that the BB&T Business Fellows would have the opportunity to experience BB&T’s Leadership Institute in Greensboro beginning this Spring. The Leadership Institute provides training for numerous Fortune 500 companies and will be offered to the Fellows free of charge through an in-kind contribution to Campbell University. For more information on the BB&T Business Fellows Program, please contact Dr. Mark Steckbeck, Program Director.